Ilke Kardes was a faculty member at the J. Mack Robinson College of Business, Institute of International Business, and served as research director for CIBER. The rise of the middle class in rapidly developing economies, known as Emerging Markets (EMs), is probably the most telling feature of these transforming societies. Equipped with substantial disposable income, middle class consumers now participate in the marketplace with stepped-up consumption of discretionary items. These include new homes, branded products, cars, education for children, and health care. The new middle class consumers in emerging markets are generally young (many between 25 and 44 years), largely urban, and better educated. They have rising expectations and are eager to consume material goods. Having been exposed to Western brands, they are also highly brand conscious. Now imagine getting a clear snapshot of the business opportunity — made possible by the arrival of substantial numbers of middle class households — in some 20 emerging markets in one easy-to-read index. This is now possible with the Middle Class Scorecard for Emerging Markets, developed by researchers at Georgia State University’s Center for International Business Education and Research (CIBER). 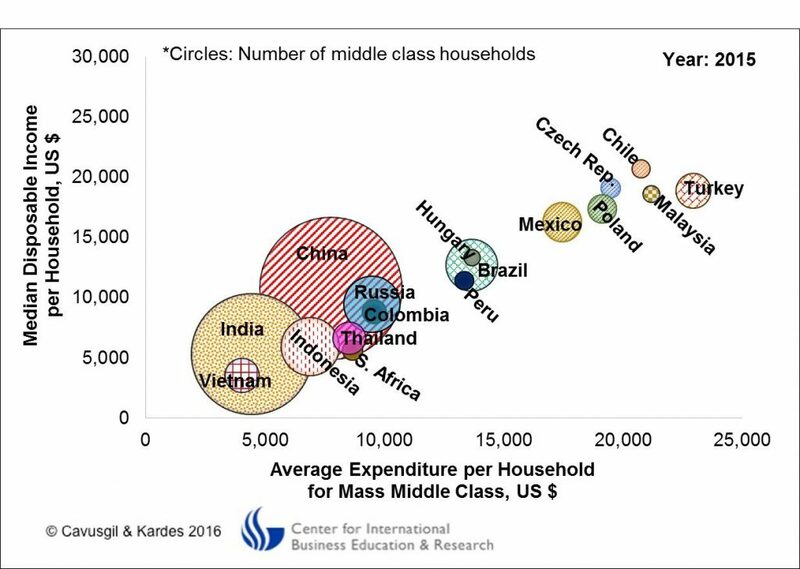 Middle Class Scorecard ranks the rapidly transforming economies based on expenditures and median income of these households. The Scorecard also provides a dynamic perspective, examining the growth of middle class over time. It also looks ahead to forecast potential size of middle class, giving an important indicator of market potential to western businesses. Absolute measures have limited usefulness in comparing the middle class across emerging markets due to differences in purchasing power. What works in India doesn’t stack up the same in Mexico. Therefore, in developing the Middle Class Scorecard, GSU-CIBER researchers considered relative measures of income and expenditures. The Middle Class Scorecard also differentiates between the top and the bottom of middle class in each country, making a distinction between an ‘affluent’ and a ‘mass’ middle class households. Data: Euromonitor data for 2005-2025, latest available: 2015. Note: Size of each bubble reflects the third indicator — the number of households estimated to be in the middle class. Finally, GSU-CIBER’s Middle Class project include additional studies, examining such topics as risk vs. opportunity, city-based market potential, sector-based market potential analysis, and company-based market potential analysis – all in the Emerging Market context.